Picture in your mind’s eye a time when your life seemed almost perfect. Who were you with? What were you doing? Where were you living? What made it so memorable? What a great story for all those sinners, tax collectors and harlots who were hanging around Jesus! To know, at the very depths of your being, that you would be welcomed home no matter what you’d done or who you’d become. A get-out-of-jail free card in the game of life. I think some of us secretly admire (or even envy) the “prodigal” son, for his courage to leave home, to break free from parental control and walk awhile on the wild side. We know that sooner or later our children have to grow into adulthood, and that often means distinguishing themselves from their parents in unsettling ways. But let’s go a little deeper into the story. The request of the son to get the share of the property that will belong to him is incredibly entitled and downright insulting. It’s very close to suggesting that his father’s long life is inconveniencing the son’s ability to have a life. And yet, the father complies, and divides the inheritance between the two young men. When you think about it, that actually means the father now has nothing, his own livelihood dependent upon his elder son’s largesse. The younger son takes his inheritance and travels far away and squanders his property in “dissolute” living. Hmm — what is that? You can fill in the blanks with whatever you imagine, but whatever he was doing, he blew through the money in short order. He’s reduced to feeding the pigs of a local farmer. It’s then, the Bible notes, that “he came to himself.” I’d always pictured this as an existential moment of self-awareness; the realization of his depraved state, and his profound desire to come home and be a different man from then on. But no! Come to find out the phrase refers to a bright idea; a savvy strategy to get out of a pickle. And see how self-serving it is. No sign of regret for hurting his father and returning to make amends. No sense of having made poor choices and resolve to clean up his act. No, he focuses on his own growling stomach: my father’s servants have plenty of food and here am I (the son for heaven’s sake), dying of hunger. Instead of hearing his prepared speech as a humble apology, try hearing it as an expedient ploy to gain sympathy. 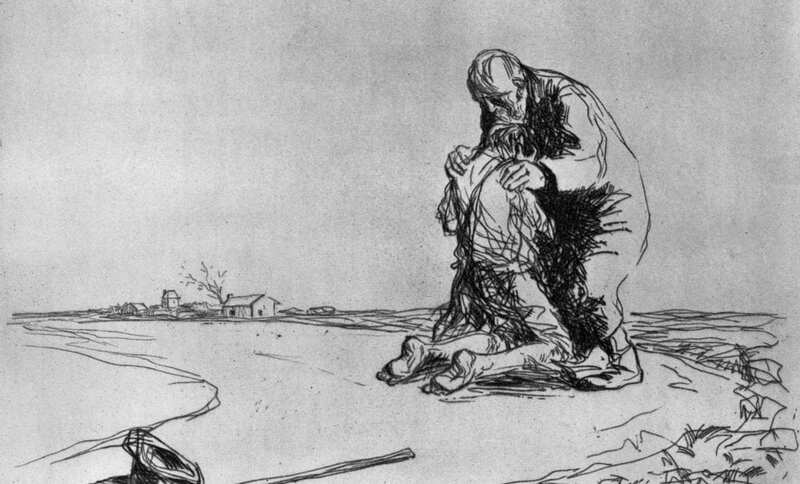 Instead we witness a prodigal father: one whose welcome is wasteful, extravagant, immoderate, excessive, lavish, bountiful and generous beyond reason (which is actually the definition of “prodigal”). He gives his loser son symbols of success—a fine robe, a signet ring with the family crest, shoes, a showy party. Friends, if Jesus’ parable is a story about God, what does it say about the almighty creator and ruler of the universe? The picture I get is of a God who wants more than anything else to hang out with us, to be at home with beloved children, regardless of our choices, our behavior, our outright rejection, our distancing tactics, or anything else we dish out. God loves unconditionally which means there’s nothing we can do and no place where we can go, that can ultimately separate us from God. No wonder the obvious “sinners” flocked to Jesus. Here was good news beyond imagination. It’s why the hymn writer called it “amazing” grace. The picture I get is of a God who wants more than anything else to hang out with us, to be at home with beloved children, regardless of our choices, our behavior, our outright rejection, our distancing tactics, or anything else we dish out. I didn’t discover “Dave’s Killer Bread” until I moved to Colorado, but am now a regular customer of its delicious, nutritious, organic, non-GMO, whole grain bread. Only recently did I learn its back story. Dave and Glenn Dahl were two sons of a man who founded a bakery in Oregon. As a youngster Dave resented having to work in the bakery, dropped out of high school, and was repeatedly arrested for shoplifting and drug use. After the death of his father, Dave promised to straighten up and returned to the bakery business. For a few months … and then the pattern repeated itself. Before long, he was doing hard time for armed robbery and assault. When he was released, he had nowhere to go but to his brother. And Glenn welcomed him back. With renewed purpose and another chance, he developed the recipe for “Dave’s Killer Bread.” It was an instant hit and in 2015 their bakery was sold to Flower Co. for $285 million dollars. Then Dave, in gratitude for the second chance he’d been given, started a new non-profit for “returned citizens” (ex-cons) to receive job training (after stable housing the most important deterrent to recidivism), and another shot at a productive, meaningful life. [Place loaf of bread on Communion Table] It sort of belongs there, I think. … who doesn’t love a good second act? Well not everyone, especially when the druggie robber makes the same profit as the responsible, faithful one. It’s just not fair! Over the sound of the celebration party, we sense the elder brother’s righteous indignation. We’ll hear his side of the story next week. Because here’s the thing. Not all of us hit rock bottom to discover our hunger. At times we feel pangs — grief, a sudden loss, a general feeling of anxiety, the fears we keep away most of the time, but find that no amount of work, or alcohol, or Xbox games can keep them from rising out of the inner recesses of our hearts and minds. Sometimes things seem to be humming along, until they’re not. Am I on the right road? Am I truly living? If the day you envisioned at the beginning of the sermon was mostly a fleeting dream or a flash from another time, take heart. There is a God who knows you, who loves you, who wants to be with you. There is a God who eagerly awaits your arrival, whether soon or late. There is a God in whom true life may be found. There is a God whose arms are as wide as earth itself, who in a voice as loud as thunder and as quiet as your beating heart, pronounces the judgment: Welcome home. In a time of silence, I invite each of us to consider the ways we have traveled away from the true north of our lives. Then rise as able for the Runaway song (on the insert); the first verse will be sung as a solo, and then please join on verse 2. Our final hymn today has never been published in a Presbyterian hymnal before this most recent one; it was deemed too “personal” — its intimate invitation to “Come home” almost embarrassing in its sentiment. Yet it somehow connected with many people, and provided the soundtrack to the movie “The Trip to Bountiful” about an elderly woman’s homecoming to her small Texas town and then to her eternal home. Please rise as able to sing it, number 418, and experience again Divine love and longing.